Why you should start a cow farming business is consisted of various reasons and they also depend on you mostly. For example, if some raise large herds to sell then others raise them to sell their milk in the case of dairy. Even some people raise cattle so that they can show at fairs and other local events. But, many families are deciding to raise cattle for their personal use in today’s economy of Bangladesh. So, if you one of them who are thinking to start cattle farming then you must have to know how to start a cattle farming business and all other things related to it. In this case, the most vital part is the fund of business and you must have to have or arrange sufficient funds or resources for starting and operating this business successfully. Starting a cow farming business has a lot of reasons. Although you may consider raising cattle on large scale for meat, some people want to raise dairy cattle for the purpose of selling milk. But, whatever your reasons are, the great positive point is that there are great demands of cattle meat in Bangladesh. After the consumption of chickens, cattle meat is the second position that is eaten frequently in Bangladesh. Also, the needs are increased in the various occasion like Eid ul Azha (the largest festival of Bangladeshi Muslims). Moreover, people prefer to feed cattle meat to their guests while there is a marriage ceremony. Thus, there are huge demands of cattle meat across the country and across the year as well. That’s why those who have the ability to start the business, they can get a good revenue from it. There are a few basics about how to start a cow farming business, whether you want to start a commercial operation or want to have a few animals for your family’s need. In the prospects of Bangladesh, cattle farming are one of the most common as well as profitable animal farming business. Despite starting with a minimum number of animals and expand gradually, the business comes with its own fair share of challenges. That’s why there is no alternative to perform a deep market research, economic and cost analysis and definitely feasibility studies. Well, let’s know what the required steps to start a cow farming business in Bangladesh. 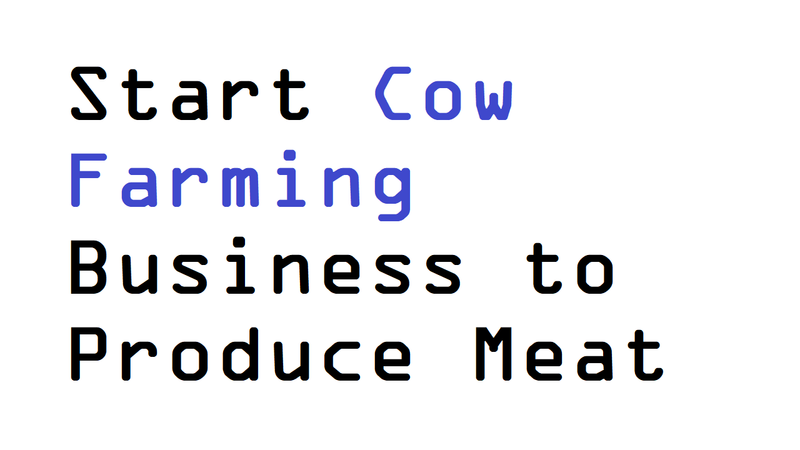 This is the first and foremost step for all business to make a good business plan for starting and operating your own cow farming business. You’ll need to research your area and note down anything that you think might cost money. For any unforeseen occurrences, it’s also a good idea to plan for emergency funds and reserves. As shelter is a must for keeping your animals safe, you’ll need to build multiple buildings and if you want to raise dairy cattle then milking parlor with stanchions. Also, you need a calf bard and a barn for holding cows because beef cattle require less housing facilities. And if you can just keep them safe inside then they will be good. After determining the purpose of your cow farming business, which is to produce meat, choose your desired breed. Although there are hundreds of cattle breed available throughout the world to choose from, you should consider the availability of your desired breed in your area. And avoid choosing the breed that is not easily available in your area. You can consider some popular dairy cattle breeds if you’re willing to start dairy cow farming business. As the part of cow farming business, feeding is much essential for both beef and milk production. If you want to keep your animals healthy then you must have to ensure quality feeding. And it’s the best option if you produce the feeds of your own. That’s why you should find out the amount of pasture that will be required for the animal. Because purchasing from another source can cost you a lot, producing hay of your own will be good. But, it will comprise large feeding costs and you should be ready for all these.